Retirement plan assets are a great way to support the work at American University because they not only help support the mission, but they also can provide tax relief for your loved ones. Name us a beneficiary of your plan. This requires you to update your beneficiary designation form through your plan administrator. Here you can designate American University as the primary beneficiary for a percentage or specific amount. You can also make us the contingent beneficiary so that we will receive the balance of your plan only if your primary beneficiary doesn't survive you. With the IRA Charitable Rollover, if you are 70½ years old or older, you can take advantage of a simple way to help those we serve and receive tax benefits in return. You can give up to $100,000 from your IRA directly to a qualified charity such as American University without having to pay income taxes on the money. Fund a testamentary charitable remainder trust. When you fund a charitable remainder trust with your heavily taxed retirement plan assets, the trust will receive the proceeds of your plan. The trust typically pays income to one or more named beneficiaries for life or for a set term of up to 20 years, after which the remaining assets in the trust would go to support American University. This gift provides excellent tax and income benefits for you while supporting your family and our work. 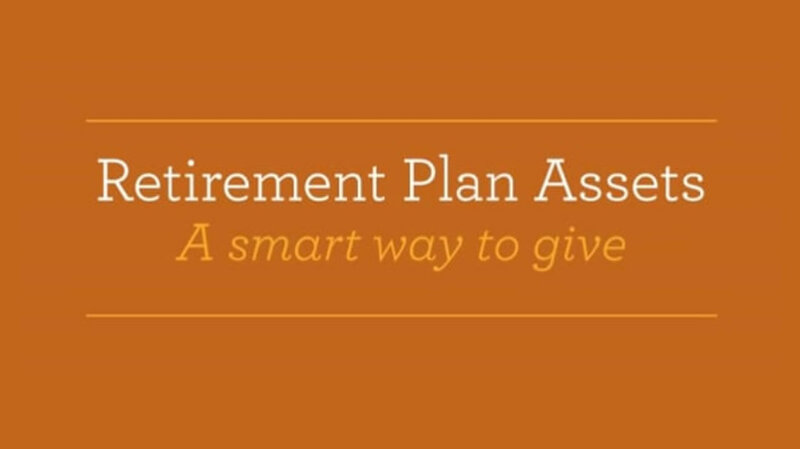 Video contains text and narration about Retirement Plan Assets. Retirement Plan Assets: a smart way to give. IRAs, 401(k)s, and similar plans are smart ways to save for retirement. Your accumulated treasure can allow you to spend your retirement years doing what you want, even help you realize a dream. But a retirement plan may not be the best way to provide for your loved ones after you're gone. If you're invested in a retirement plan, you may already know that distributions are taxable when taken during your lifetime. But did you know that after your lifetime, distributions from the account to your loved ones can be subject to federal, and in some cases, state income taxes? And for some estates, the remaining value of your account may be subject to federal estate and state inheritance taxes as well? This heavy tax burden can take a big bite out of your account in some cases depleting its value by more than half leaving your loved ones with mere morsels and spoiling your legacy. Fortunately, there is a way to ensure 100% of these assets do good after you're gone. Name our organization as the beneficiary of your retirement plan The assets you designate to us will pass tax free and you can pass other less tax burdened assets to your loved ones. It's one of the most popular ways to give retirement plan assets. Not only does this arrangement allow you to have a substantial impact on our mission, maybe at a greater level than you could otherwise afford, it also restores the full potential of your legacy. The recipe is easy. Request a beneficiary designation form from your plan administrator. Designate our organization as the primary, or a contingent beneficiary, of the entire amount, a certain dollar amount, or a percentage of the remaining assets. Sign, date and return the completed form. After you've returned the form, please let us know you've provided for us in your estate so we can thank you. We'll be grateful for your generosity. And you'll feel satisfied having tasted the sweetness of giving back. For more details, including other ways you can give retirement assets, download the ebrochure, Make the Most of Your Retirement Plan Assets, from this website. The information in this material is not intended for tax or legal advice. Please consult with your professional advisor before making a gift.